Winters are long. Finding things to do that a specific to our area and climate have longevity. 8th Grade art students study the history of art of making the snow snake and then make snow snakes for their school’s annual “Snow Week”. Each grade chooses one of the art student’s snow snakes for competition. 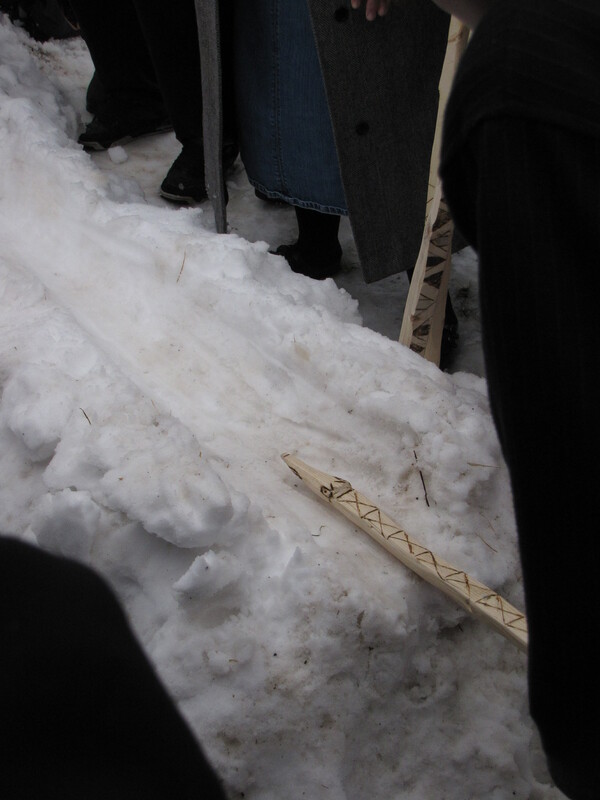 Native Americans living in snowy locations created a traditional challenge game involving creating a snow snake, a specifically prepared stick out of wood, and throwing it down a prepared track. The snake that traveled the farthest after three tries would win. The game was played to pass long winter days as well as sharpen hunting skills. We can track it’s use by the Iroquois over 500 years ago to the Fur Trade period with Woodland Tribes in the mid 1800’s as well as modern times in the 2010 Arctic Winter Games in Grande Prairie Alberta Canada. It was used to hone spearing skills. The track the snake runs down is made by piling up snow in a mound about 76 cm high (30 inches) gradually sloping to ground level by the end of the run. Some tracks run a mile in length! Typically the track is built on the day it is to be used. 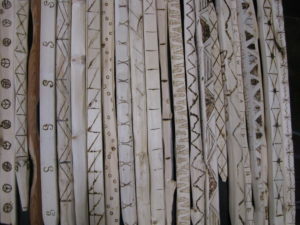 A log is used to make a smooth groove along the top center area for the snow snake to travel. The groove track needs to be kept as straight and even as possible. Some snow snakes measure up to 1.83 meters long (6 feet) or more and as short as 1.21 meters (4 feet) called a mudcat. The shortest version is about 15 cm (6 inches in length) and is called a snow dart. Typically the wood is harvested and cured up to eight years to assure the snake doesn’t crack or curl in an undesired way. Oils and waxes prepare the snake to travel over the snow easily. Assignment 1: Preparing the repeating motif – accurately use meters and centimeters in create a design to be used on a one meter long snow snake. On paper complete a 5 cm x 1 meter long grid and create the intended design. Use a consistent repeating motif measured in centimeters. This design will be burned into the top face of the snake using a wood burner. Additional color is optional. Naming your Snow Snake – go to the Ojibwe People Dictionary and look up the words for snow. Choose a name for your snow snake. Wood burn your name and the snake’s name into the side of the snake. Assignment 2: Carving the Snow Snake – demonstrate a working understanding of Newton’s Law’s of Motion. Carve (Swedish Mora carving knife. Safety – sharpen as needed) and finish a snow snake with a bottom sliding surface that is carved smooth – finished (wax , pine tar or polyurethane/sanded for optimum sliding ability – demonstrating an understanding of resistance and kinetic friction. Participate in all safety lectures before carving. 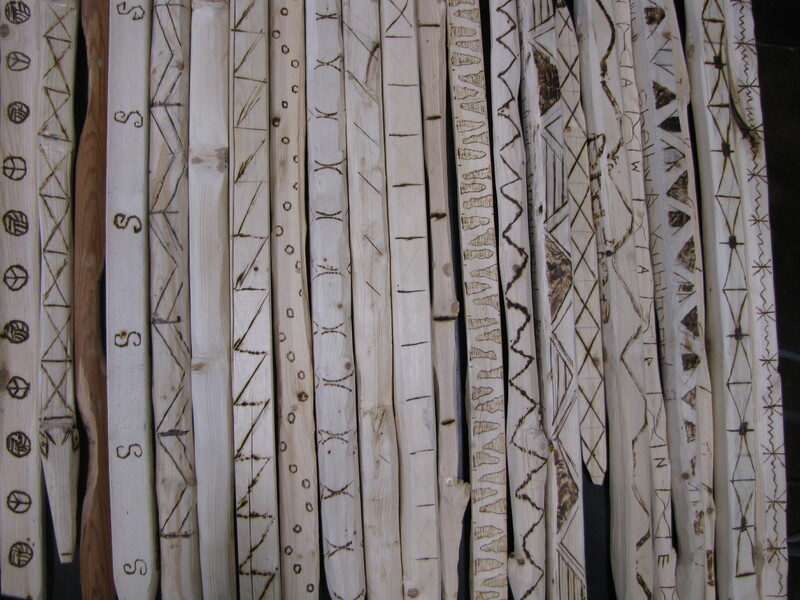 Grading on the snow snake is based on completion of the snow snake: work in the studio, controlled carving /smooth surfaces/no knots or jagged edges, Ojibwe naming of snake, in centimeters clean repeating motif burned in the top, good design, completed finishing of the bottom.